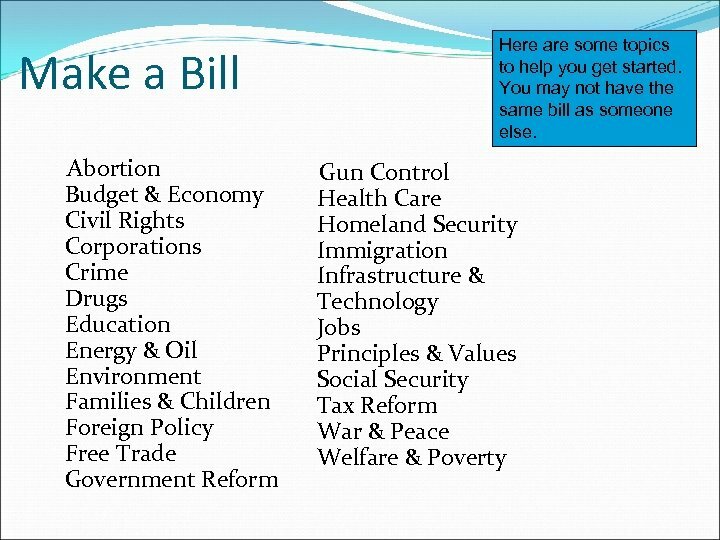 Make a Bill Here are some topics to help you get started. 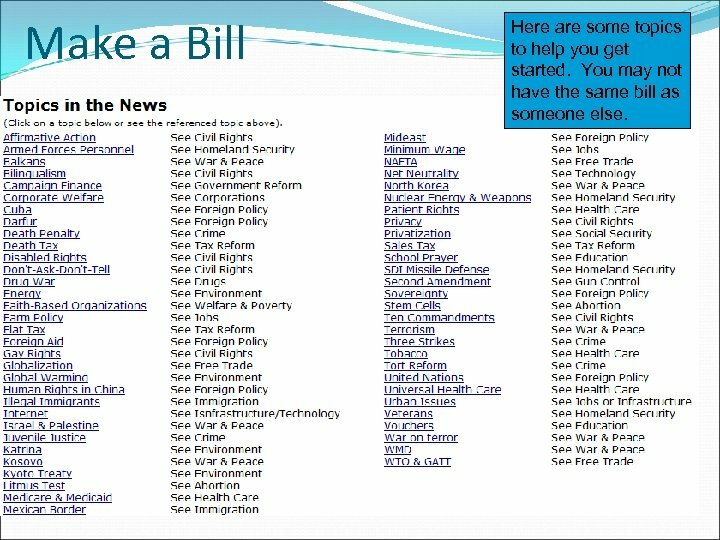 You may not have the same bill as someone else. 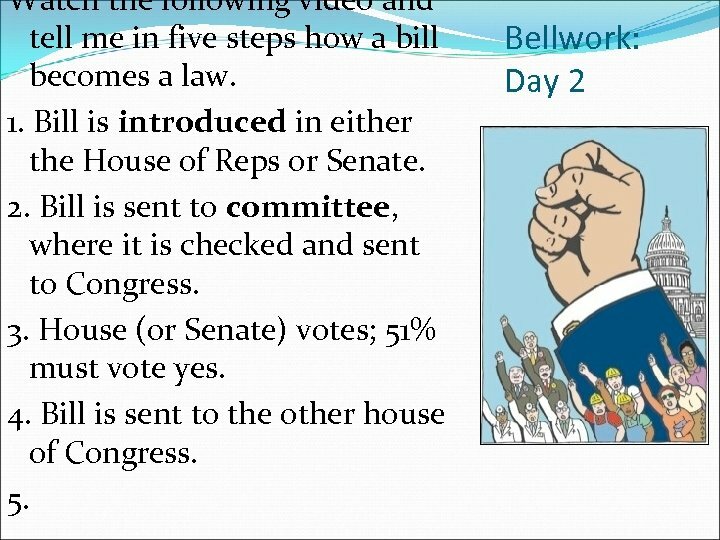 The Constitution and the Legislative Branch Article I creates a bicameral legislative branch of government. 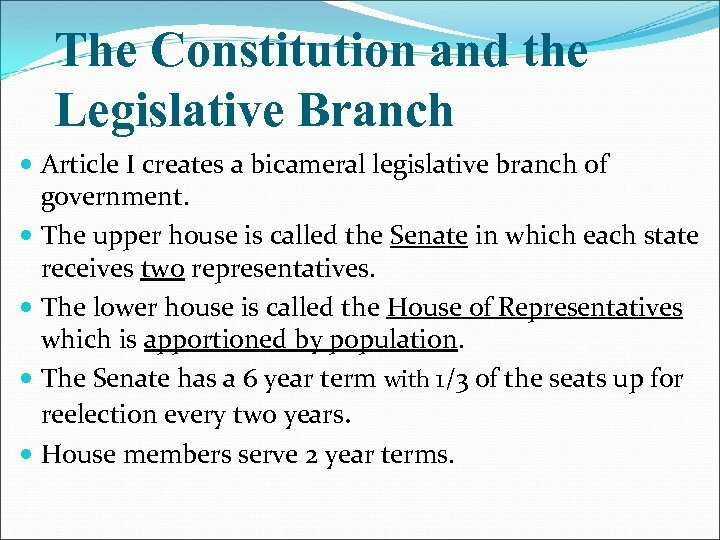 The upper house is called the Senate in which each state receives two representatives. The lower house is called the House of Representatives which is apportioned by population. 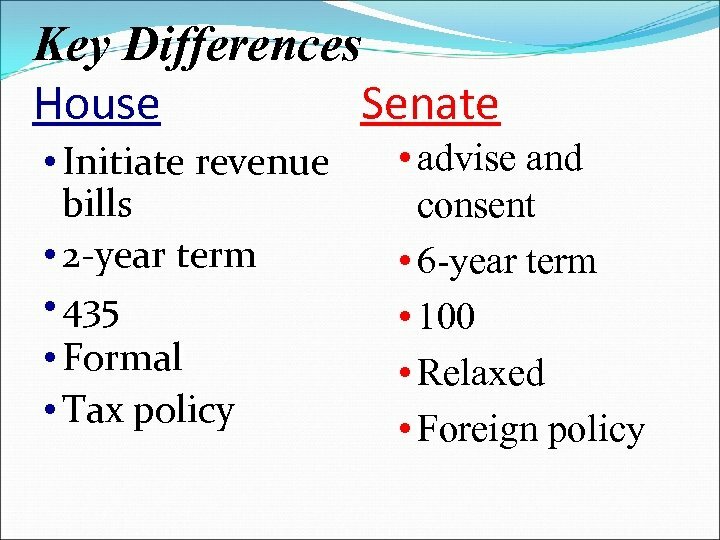 The Senate has a 6 year term with 1/3 of the seats up for reelection every two years. 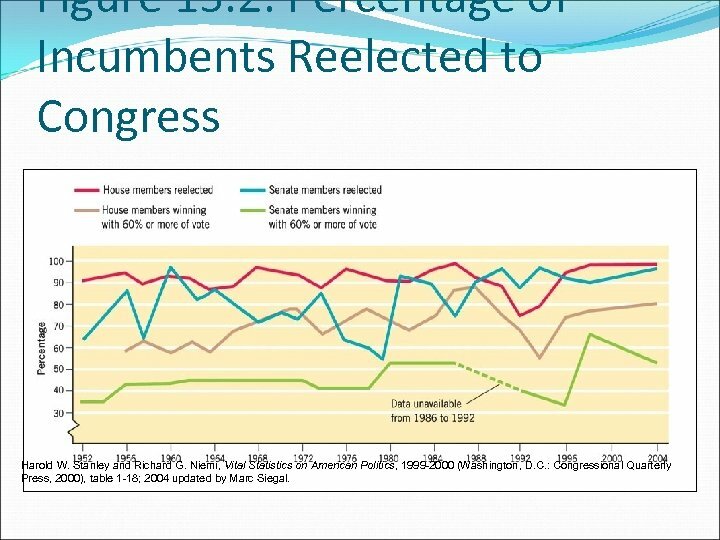 House members serve 2 year terms. 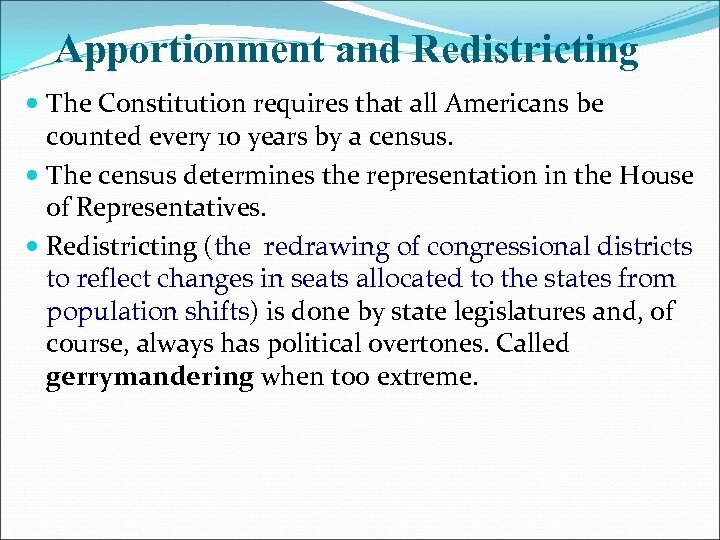 Apportionment and Redistricting The Constitution requires that all Americans be counted every 10 years by a census. 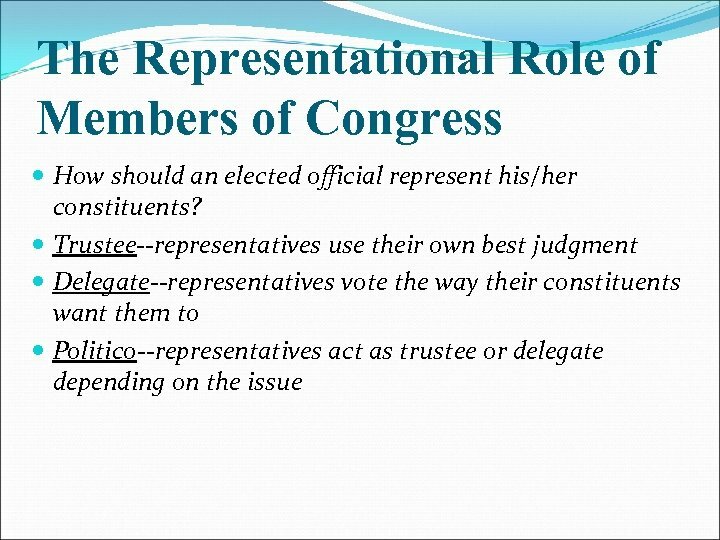 The census determines the representation in the House of Representatives. Redistricting (the redrawing of congressional districts to reflect changes in seats allocated to the states from population shifts) is done by state legislatures and, of course, always has political overtones. Called gerrymandering when too extreme. 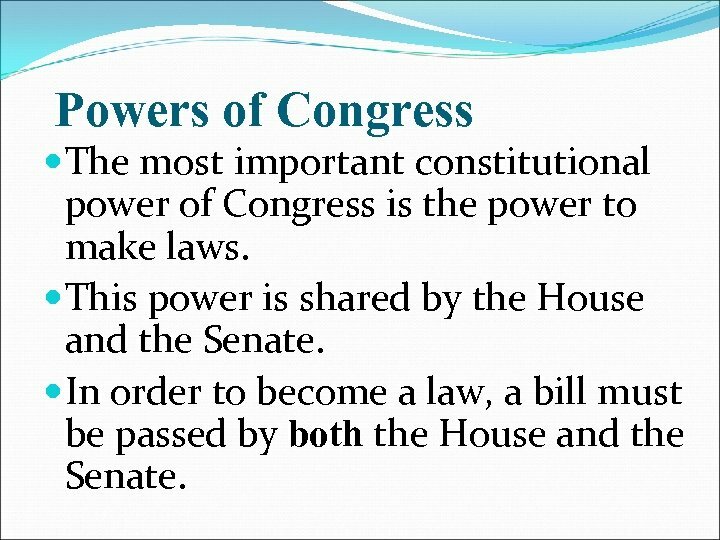 Powers of Congress The most important constitutional power of Congress is the power to make laws. This power is shared by the House and the Senate. 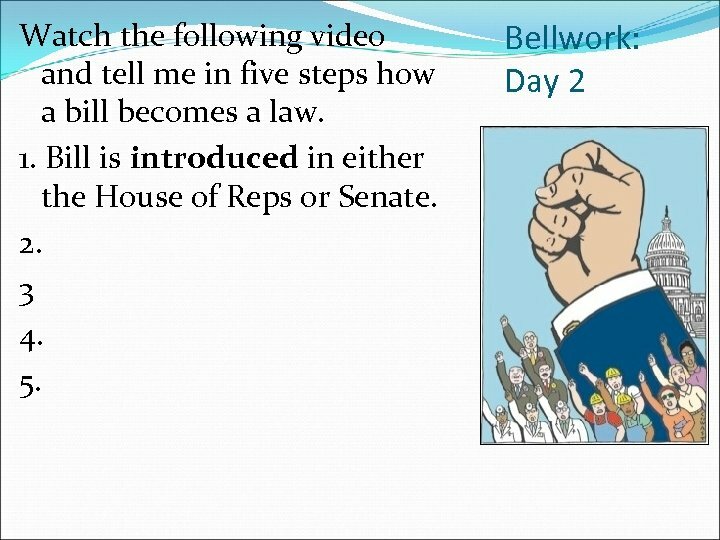 In order to become a law, a bill must be passed by both the House and the Senate. 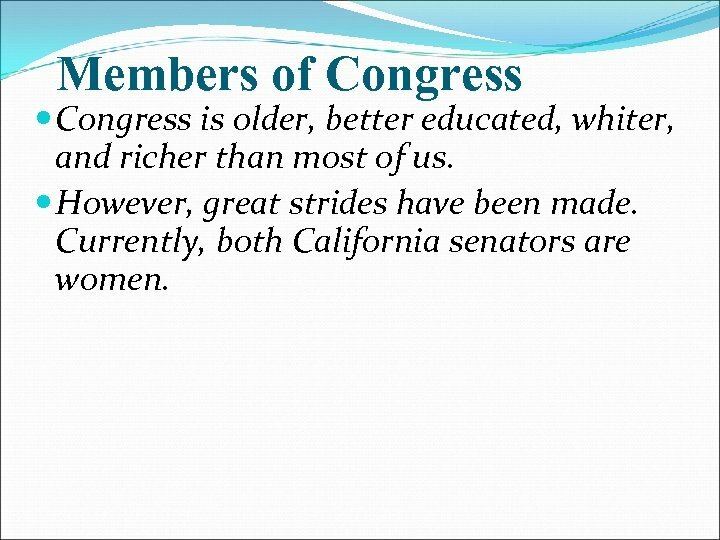 Members of Congress is older, better educated, whiter, and richer than most of us. However, great strides have been made. 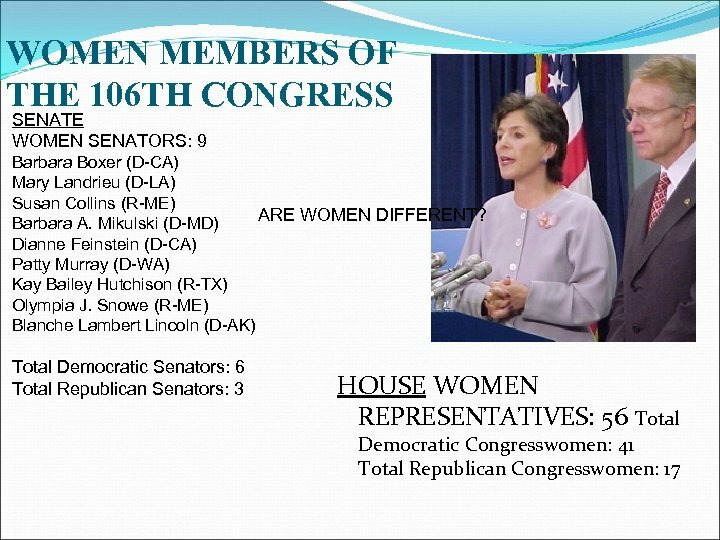 Currently, both California senators are women. 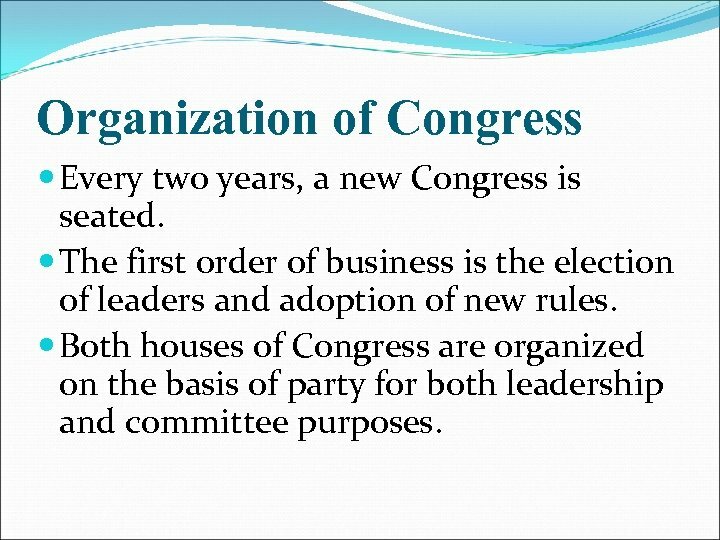 Organization of Congress Every two years, a new Congress is seated. The first order of business is the election of leaders and adoption of new rules. 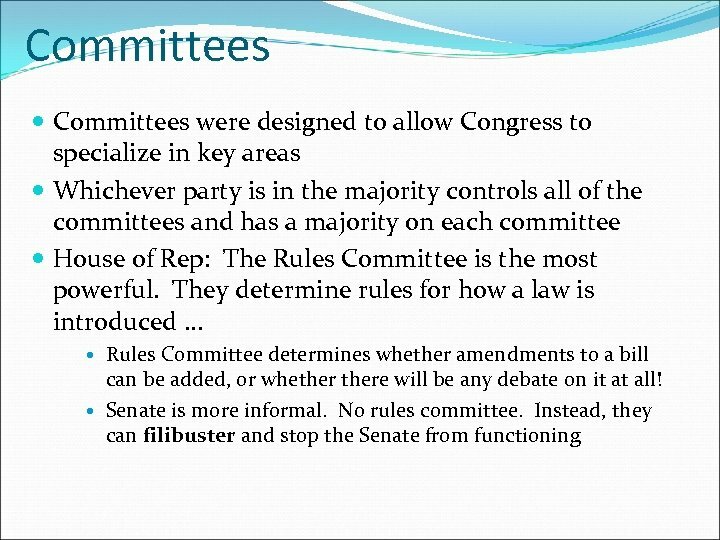 Both houses of Congress are organized on the basis of party for both leadership and committee purposes. 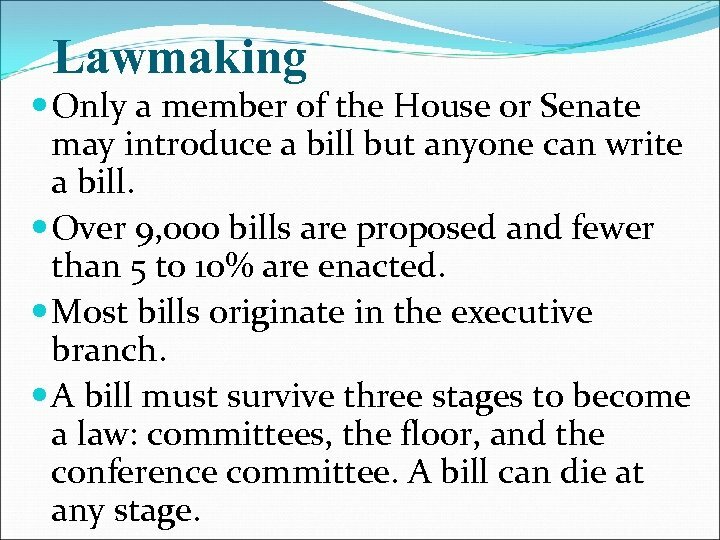 Lawmaking Only a member of the House or Senate may introduce a bill but anyone can write a bill. Over 9, 000 bills are proposed and fewer than 5 to 10% are enacted. 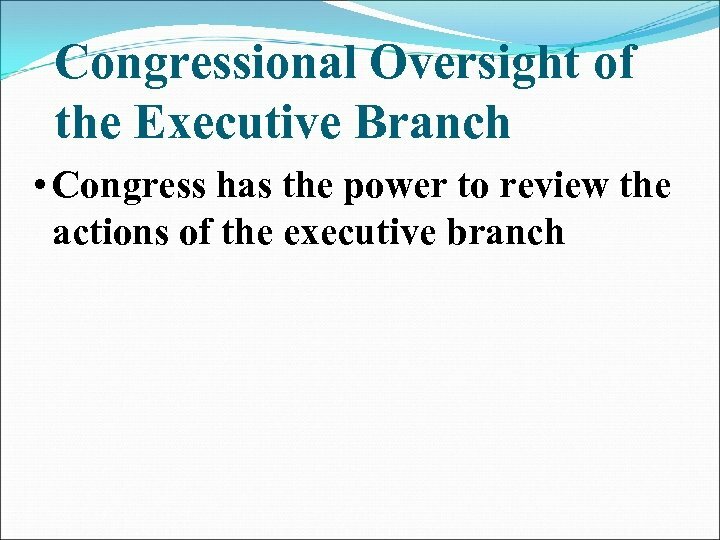 Most bills originate in the executive branch. 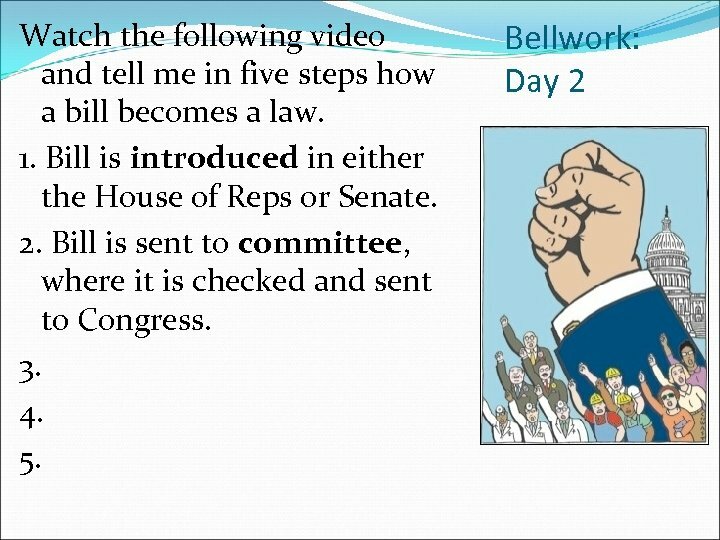 A bill must survive three stages to become a law: committees, the floor, and the conference committee. A bill can die at any stage. 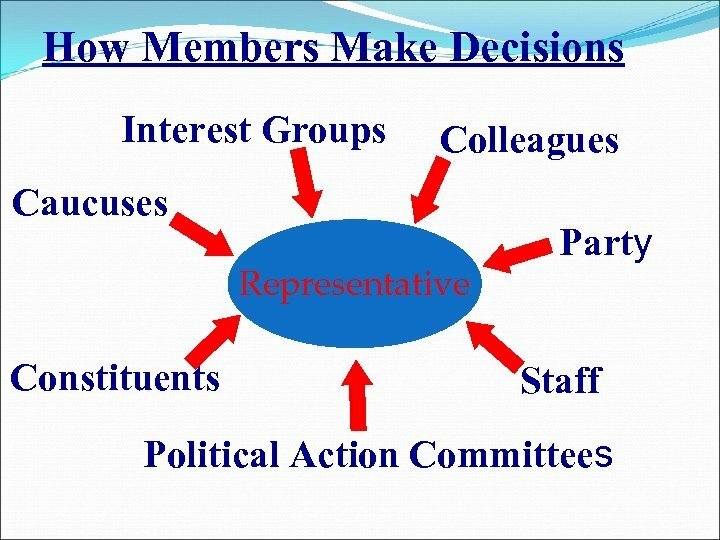 How Members Make Decisions It is rare for a legislator to disregard strong wishes of constituents, particularly on hot button issues or those contentious issues that get a lot of media attention. 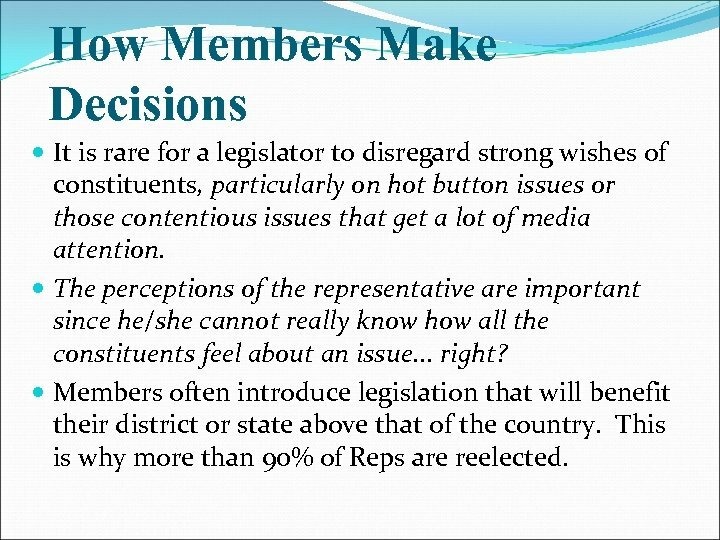 The perceptions of the representative are important since he/she cannot really know how all the constituents feel about an issue. . . right? 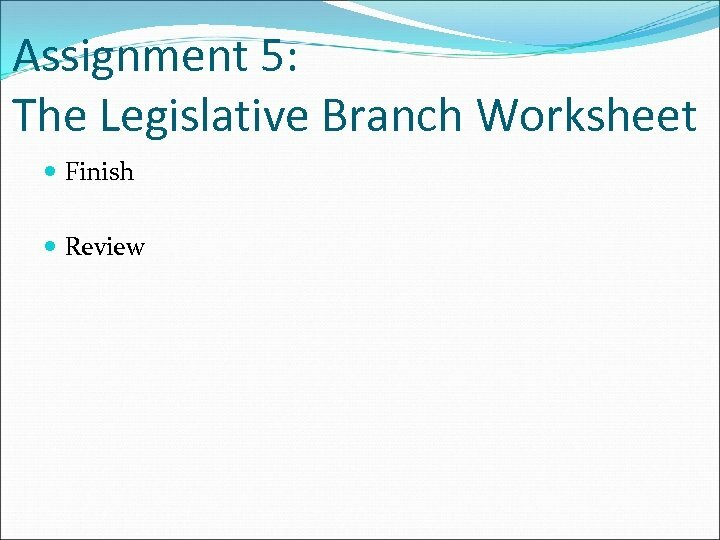 Members often introduce legislation that will benefit their district or state above that of the country. 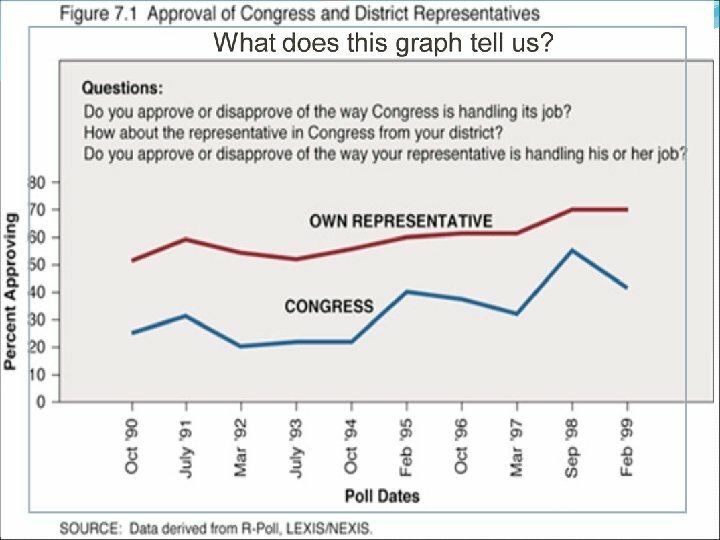 This is why more than 90% of Reps are reelected. 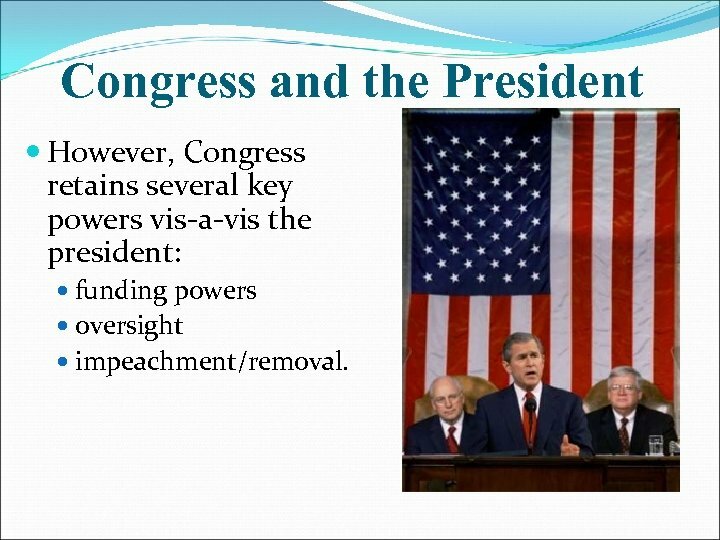 Congress and the President However, Congress retains several key powers vis-a-vis the president: funding powers oversight impeachment/removal. 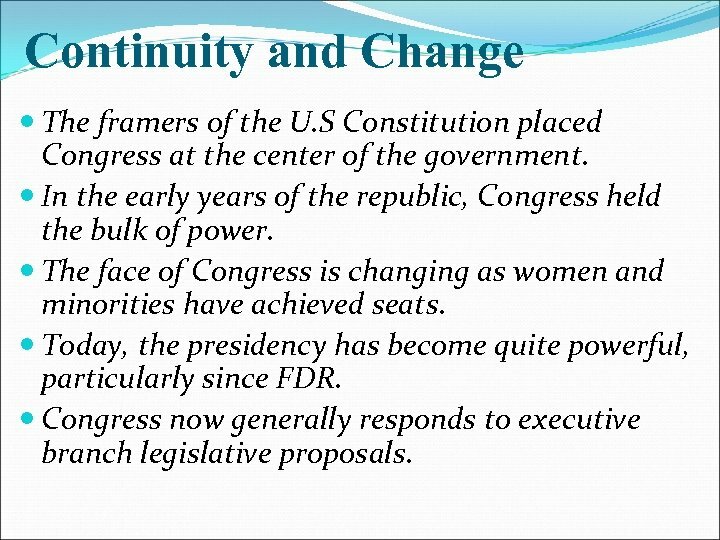 Continuity and Change The framers of the U. 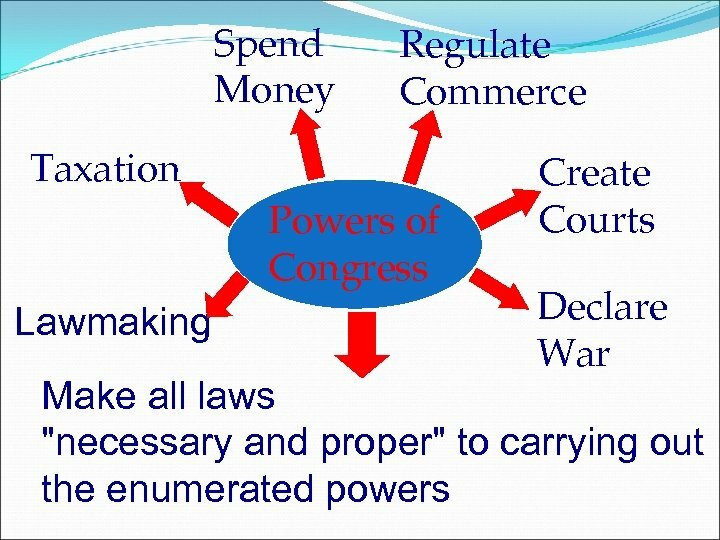 S Constitution placed Congress at the center of the government. 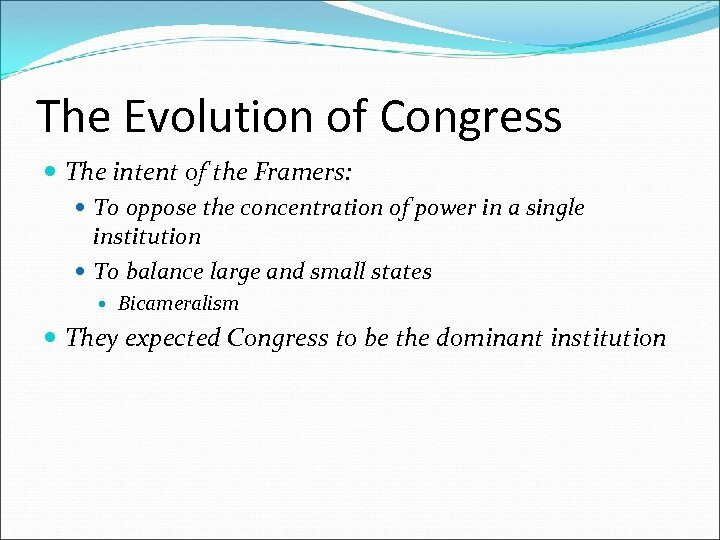 In the early years of the republic, Congress held the bulk of power. 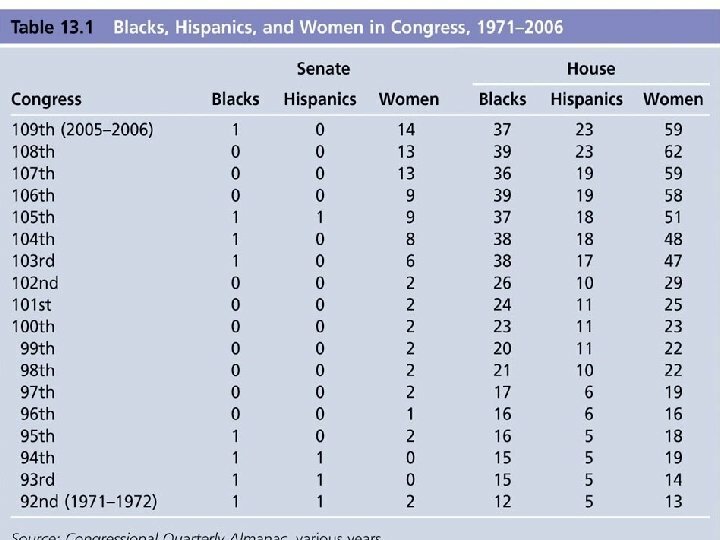 The face of Congress is changing as women and minorities have achieved seats. Today, the presidency has become quite powerful, particularly since FDR. Congress now generally responds to executive branch legislative proposals. Figure 13. 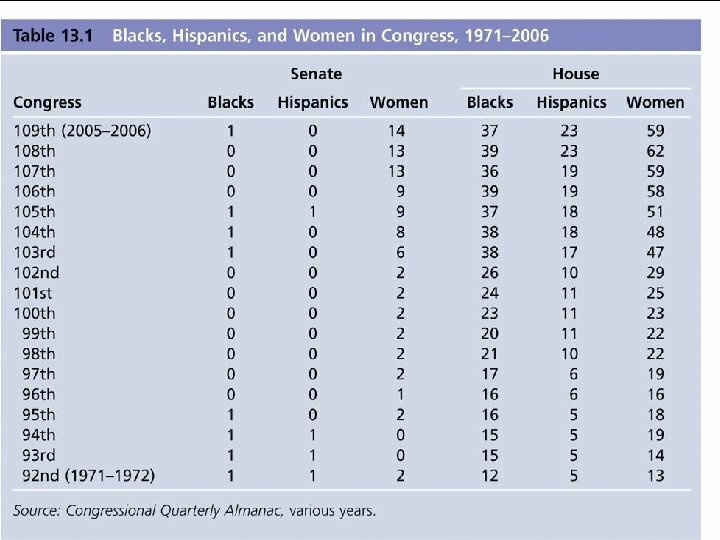 2: Percentage of Incumbents Reelected to Congress Harold W. Stanley and Richard G. Niemi, Vital Statistics on American Politics, 1999 -2000 (Washington, D. C. : Congressional Quarterly Press, 2000), table 1 -18; 2004 updated by Marc Siegal. 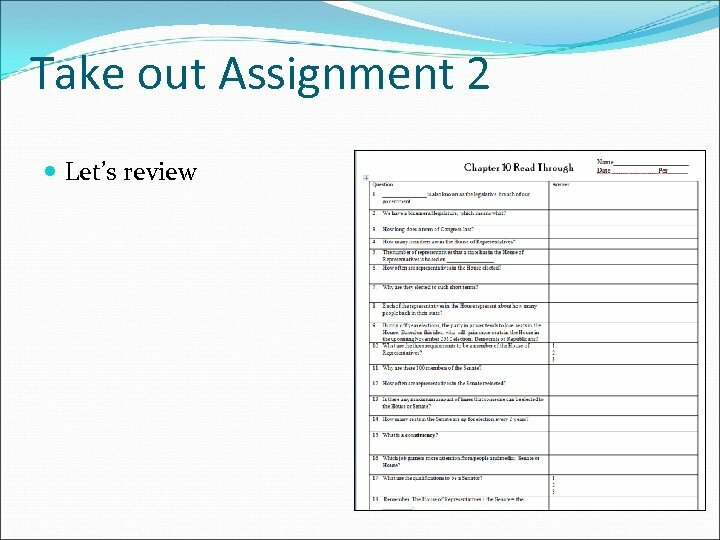 Create Your Own Bill Requirements: 20 Points- Blank Bill Worksheet: Correctly fill out and use appropriate bill-language. This means do not use words like you, I, basically, kinda, sorta, sometimes, etc. Make sure you fill out everything in the right place. Carefully read where everything should go. 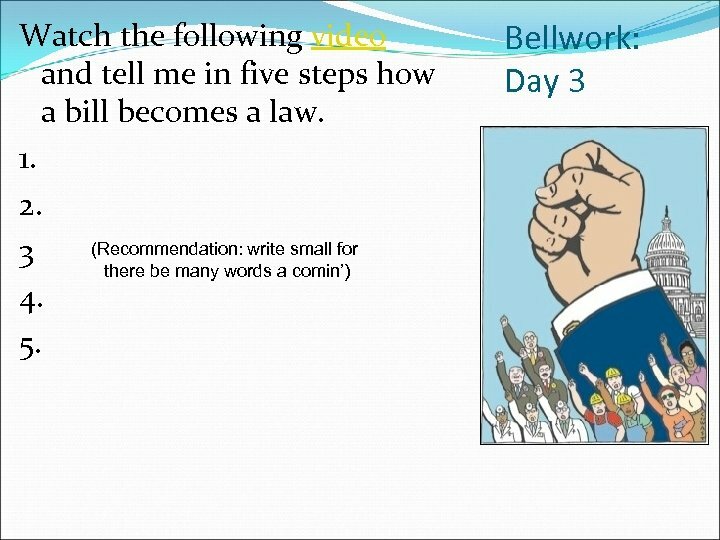 10 Points - Visual: Create a visual (poster, commercial, etc. ) for your Bill. 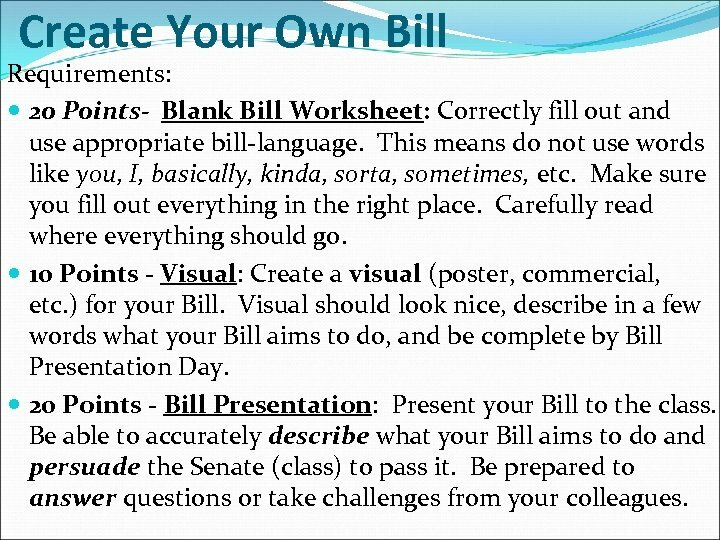 Visual should look nice, describe in a few words what your Bill aims to do, and be complete by Bill Presentation Day. 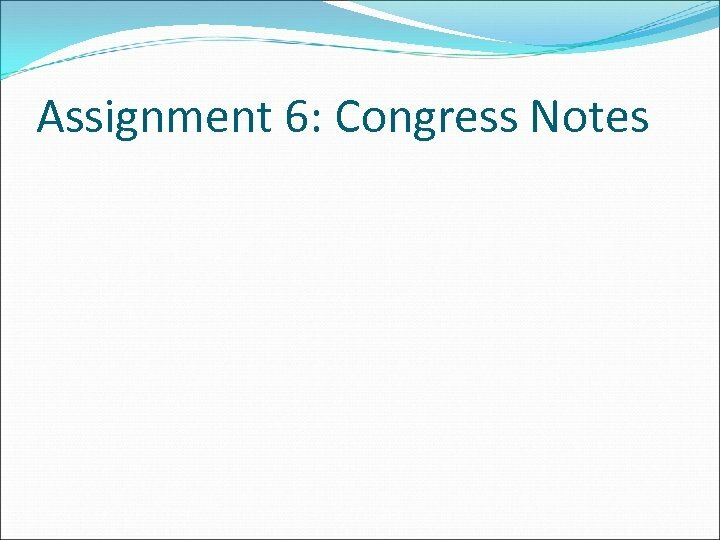 20 Points - Bill Presentation: Present your Bill to the class. 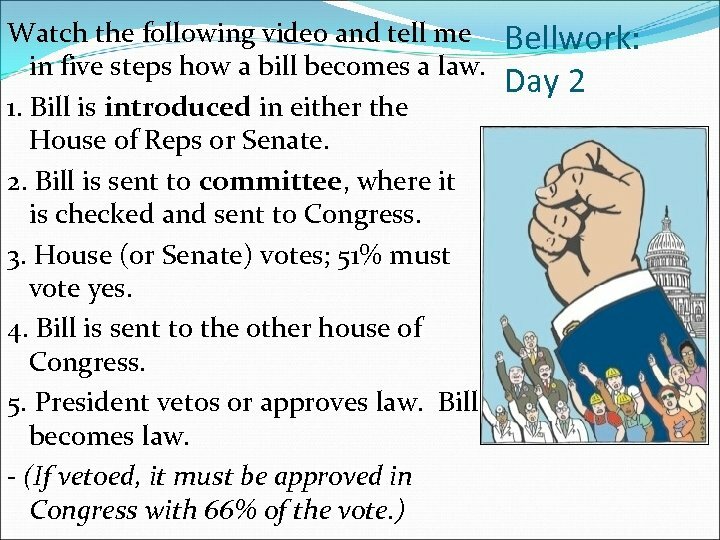 Be able to accurately describe what your Bill aims to do and persuade the Senate (class) to pass it. Be prepared to answer questions or take challenges from your colleagues.